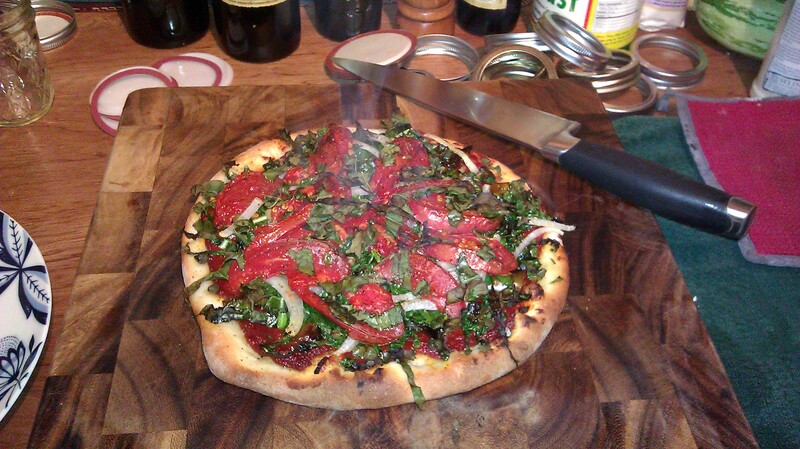 The following article is one I wrote for Edible Idaho South, all about a wood-fired pizza oven I built in the backyard. It was published for the Winter 2013 issue. During the hot summer months, few things are better than homemade pizza on the patio and few things are worse than turning the oven on full blast while trying to keep the house cool. This was my realization two summers ago while starting to sweat standing beside our 1950’s cast iron oven as it radiated heat into a relatively cool house on the hottest day of the year. There had to be a better way to make pizzas without melting. Before moving to Boise, I lived in Ironbridge, England for a couple of years. There, my partner worked for a small woods organization that offered classes on how to make everything from “green wood” furniture to foot-powered lathes. 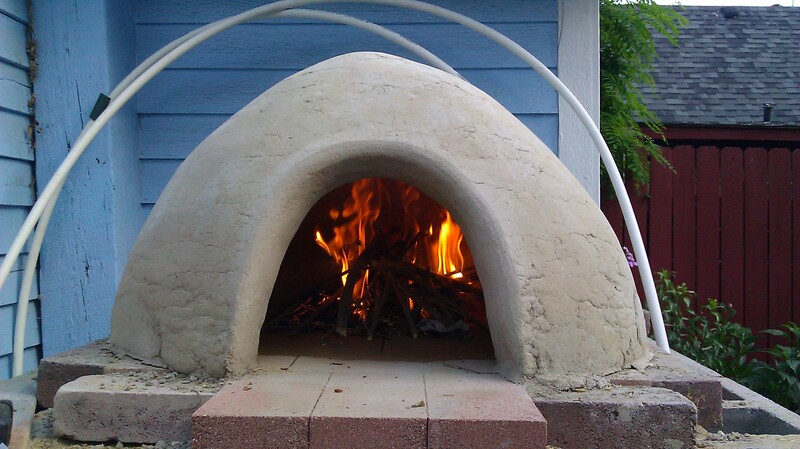 Once a year, they taught people how to build wood-fired earth ovens. At the time, we didn’t have enough outdoor space for one, so, although fascinating, we never signed up. Waiting for the pizzas to finish cooking and warming the house, I decided building an earth oven was an important project before next summer. I am a maker and have been all my life, preferring to create things rather than buy them. I enjoy making bread and beer, but also trebuchets and robots. There’s something intrinsically fun about the act of creation. The euphoria of envisioning a new project; the excitement of seeing it take shape and (unfortunately less often), joy of finishing. This project appealed to me because it would give me something challenging to build and once finished, would allow me to make delicious food. We started building the oven in the Spring, as soon as it was warm enough to comfortably work outside with wet sand and clay. We started by forming a sand mold for the inside of our oven as our fingers went numb. Once that set, we mixed “oven mud”. 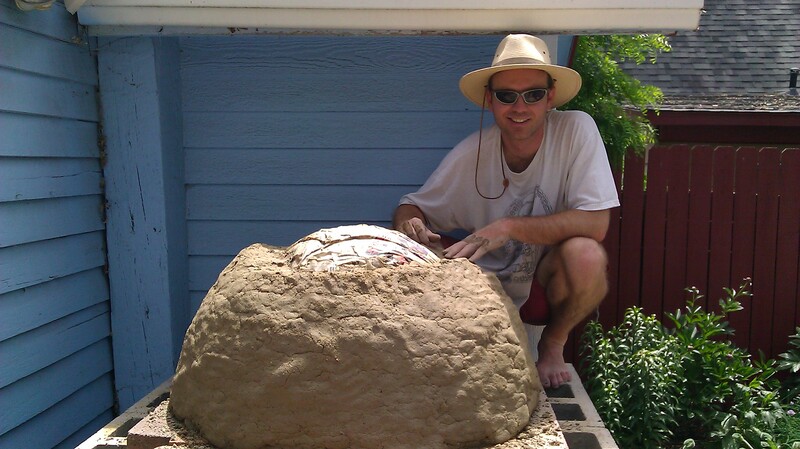 It turns out that mixing 30 lbs of clay, 120 lbs of sand and water is quite the task. We didn’t have a cement mixer which would have made the process much easier, so instead, we put down a tarp, poured on the materials, took off our shoes and jumped in. 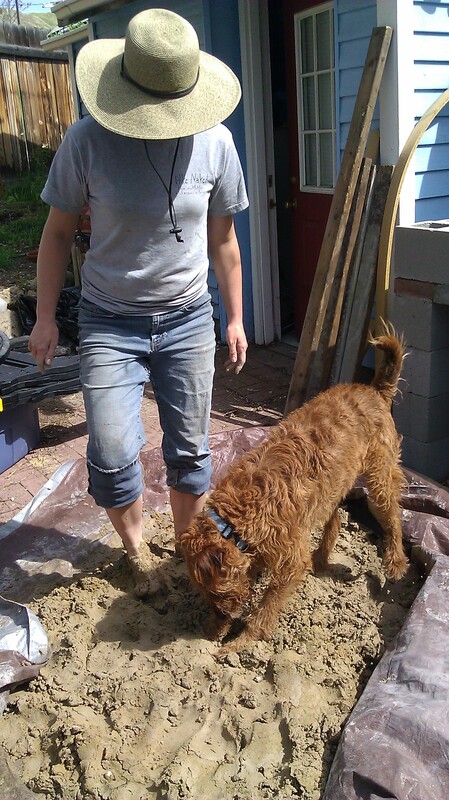 Jamie, our dog, even decided to help by digging. The cool gray mud oozed between our toes and feet grew heavy. After about 20 tiring minutes of dancing, digging, folding and jumping, we were exhausted and the oven mud was ready. We scooped the thick mud onto the sand mold to create the main walls for the oven. The following weekend, the clay was dry so we dug into the cold sand to remove the mold. Our oven was now a small dirt igloo. We should have added an layer of insulation but we were too anxious and excited about our first firing to wait. We read that when cooking with an earth oven, the objective is to use residual heat stored in the walls and floor to cook food rather than direct fire. This should provide a more even heat. With that in mind, we built a fire and let the oven warm. 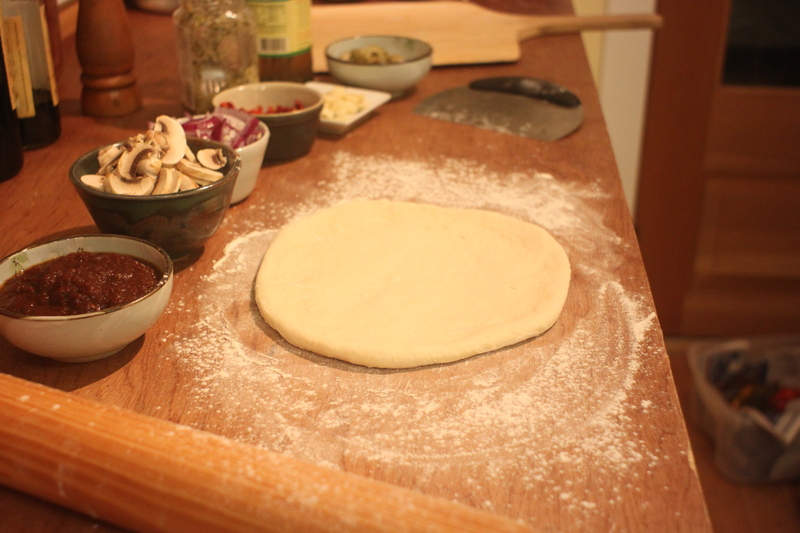 At the same time we grabbed tomatoes and basil from the garden; rolled out the dough; and piled on the toppings. After an hour of heating, I touched the outside of the oven and my hand jumped away from the scalding clay surface. We scraped out the glowing coals and put in the pizzas. The first pizza cooked for seven minutes and came out golden brown. Amazing! 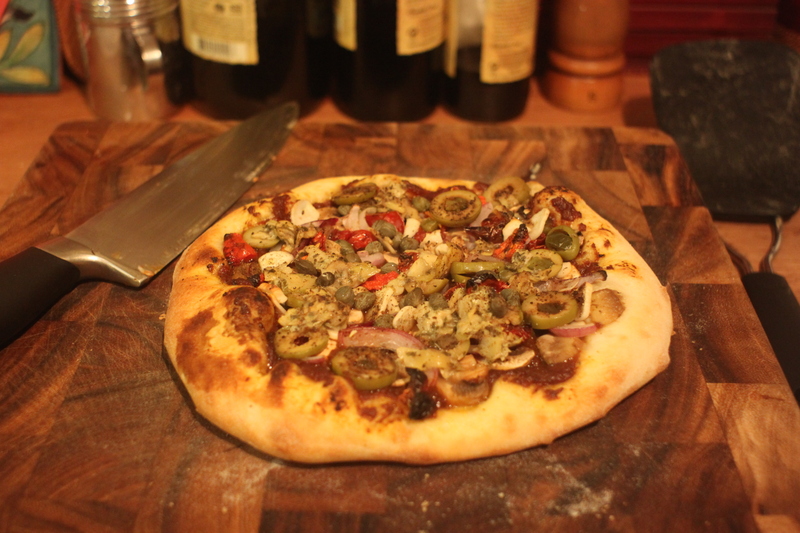 After second one cooked for 20 minutes, the crust remained soft, white dough. The savory aroma of the first pizza made me so hungry, I was no longer concerned with the right way of cooking in an earth oven. I removed the pizza, built a small fire in the back and threw the pizza back in. It did not cook evenly, but it cooked and was almost as tasty as the first one. As with most Makers, or hobbyists in general, once a project gets to the good enough stage, interest wanders to the next project. As a result, the oven sat there for months in its state of semi-completeness. We would have friends over, build a fire, make pizzas and just leave a small fire in the back while cooking. This worked but meant the pizzas were always at risk of crossing over from delicious dinner to charred catastrophe. Finally we decided to add the insulation layer. Again, we pulled out the tarp, clay and sand, but this time we also mixed in wood chips and straw. After more dancing, digging and folding, the insulation was ready. We added the new layer and built a roof above the oven. After all this work, we didn’t want rain dissolving the clay and washing the whole project away. One hour into our next firing, I quickly and gingerly touched the top of the oven. This time, it felt as cool and sandy as when we started. I reached inside the oven and the intense heat singed the hair off my hand. We removed the coals, let the residual heat cooked all four pizzas and it was still hot enough to bake a loaf of bread. We then looked around for other things to bake. A cobbler went in next and the oven was still warm. I also roast coffee at home and decided to see how green coffee beans would do. They roasted nicely and got a slightly smoky flavor. Finally, we threw salt into a pie pan and added wood chips for more smoke. Unfortunately, the salt only acquired the slightest hint of smoke but we’ll try it again next time with more wood chips to see increase the flavor. Although it took longer than expected, it was a successful project. We are now able to make pizzas on the back porch during the summer and not heat the house. It’s been fun to have friends over to make pizzas and now with summer behind us, we’re starting to look for other foods to bake in the oven. Perhaps some winter vegetables from the garden or a shepherd’s pie… so many possibilities, but for now, they will have to wait. I’m too busy thinking about my next big project. This entry was posted in Other Writing and tagged earth oven, pizza oven. Bookmark the permalink.